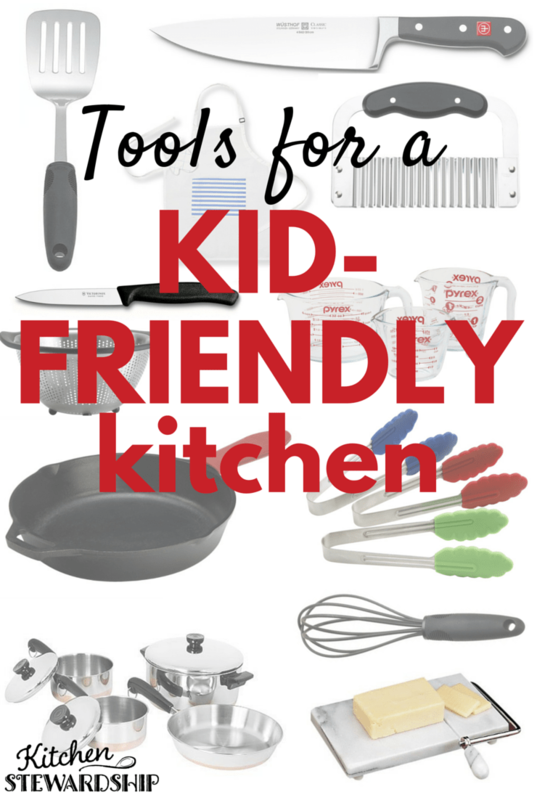 If you’re looking for kid-friendly kitchen knives, cookware, and tools you’ve come to the right place! 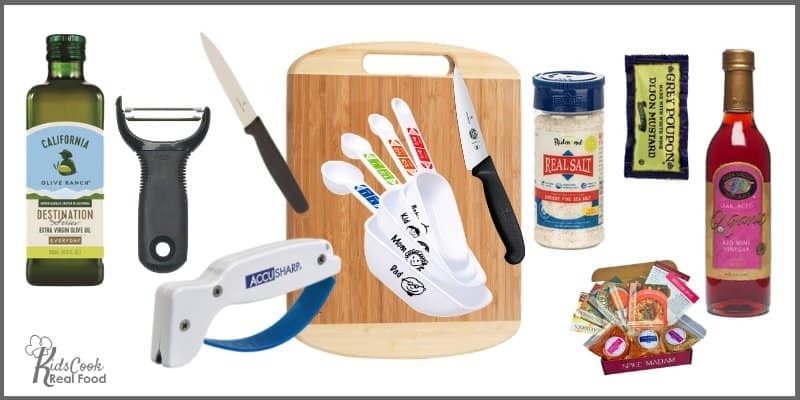 TruChef KIDS Knife set – very small chef’s knife, paring knife, peeler, scissors and holder – in blue or pink. We’ve really enjoyed this set and it makes a great gift! The related onion goggles are excellent too. Fibrox 6-Inch Chef’s Knife, better for little kid hands! Classic 4-Inch Paring Knife One of our small-handed team members uses this in place of a chef’s knife and says it can do almost anything, from dicing veggies to cutting chicken. It’s a good fit for children’s hands, sharp and sturdy enough to make an impact, and America’s Test Kitchen #1 economical pick (after Wusthof brand). This knife is affordable enough to be a stocking stuffer! Kai Little Chef – only 12.5 cm long, real stainless steel, sounds like a real winner for little hands!! Get our favorite kid-friendly knives, plus more right here. 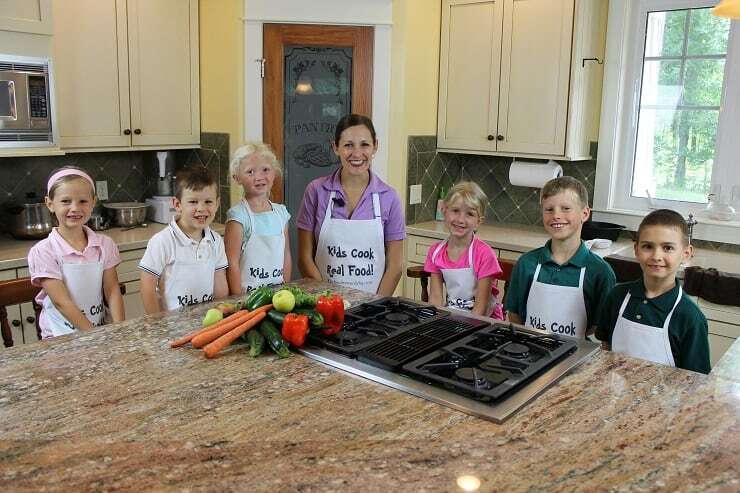 Children’s Apron and Matching Chef’s Hat – So many colors to choose from! MasterChef Junior has a cute line of kid-size kitchen goods! Mini tongs are for small children (Beginner Level) to move cut items to a plate or to serve – good for finger dexterity and pencil grasp! 11 and 14-inch silicone/stainless steel tongs – the easiest we’ve found for turning veggies while sauteeing and not burning fingers!!! Dozenegg Square End Spatula you’ll see this metal spatula on cast iron in the videos, and I LOVE using it! Necessary for cast iron and eggs IMO. OXO Good Grips Spatula flexible and great for cookies! There is a HUGE range of prices here. Zojirushi is the cream of the crop and on down to your familiar kitchen brands. This is one item that is great to check for at thrift stores. People often send them off in perfect working order! Spiralizer – We love making “zoodles” and more at our house! Someday I’ll have to do videos, but trust me, these are kid-friendly tools. I’ve tried a few and this is the best counter-top version and this is a super low-priced cute little thing. Instant Pot 6-qt: this is the one in the Premium Content videos and it does great for a family of 4-6 people. Many recipes fit doubled. Newer ones are coming out with a few more features and “Smart” technology, if you dig that kind of thing. Get this glass lid to use the IP as a slow cooker. Get an extra sealing ring if you’d like to make sweet things too – the ring does hold some flavor/aroma from savory dishes. Keep in mind that an Instant Pot can also be used as a slow cooker…but sometimes you need both! This Bella brand is the most similar available to the one in the videos. It has its pros and cons! I would recommend 6-quart or larger for families. Hamilton Beach is a very good brand yet inexpensive and what I’d buy if I needed a new one. They have a couple that are good for taking away from home, a fancier programmable model, and even an 8-quart size. This KitchenAid 6-quart is guaranteed to be lead and cadmium-free, according to my friend Heather. Of course Crock-Pot brand is good too! They offer a basic 6-quart with locking lid, a 7-quart no frills model, and a fancier programmable one. Real Salt: Not only do I LOVE Redmond as a company, this is the only salt I use in my house, and I buy it by the bucket! It’s high-quality at an affordable price, and available in mainstream grocery stores. Note: Be sure to only use GELATIN in the class 6 recipe – not collagen (use the coupon KS10 for 10% off!). It won’t gel, although it has many health benefits and goes great in smoothies. Costco or Sam’s seem to always carry at least dry pinto beans. Costco carries organic canned beans. Aldi will often have dry black beans or pinto beans but it depends on your market. They carry canned beans for a great everyday price and sometimes do have organic ones as a special buy. 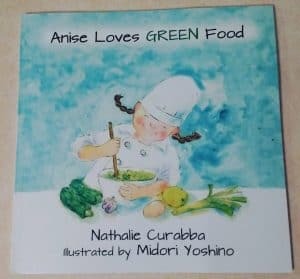 New Favorites for New Cooks: This cookbook is written by a chef who is the founder of Charlie Carts, an amazing real food cooking program for kids – one of my team members has been lucky enough to experience them at her local library and was very impressed. I love that there are 50 recipes, all whole foods, and every one we have tried has been incredibly delicious!! 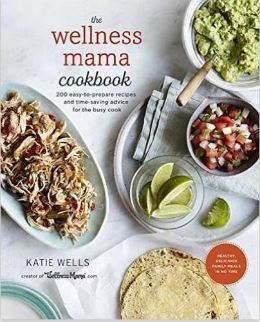 The Wellness Mama Cookbook is not written specifically for kids, but as a mom of 6, my friend Katie (the author) includes a ton of kid-friendly recipes, all real food stuff, and plenty of things I know that her own kids make. We’ve been cooking from it regularly and have yet to find a recipe we didn’t love! The Holistic Rx: Your Guide to Healing Chronic Inflammation and Disease – in children! Dr. Madiha Saeed spent years compiling this incredible resource using FOOD (and lifestyle) to truly heal over 70 diseases that haunt children and families. I’ve met Dr. Saeed, and she is one of the most genuine, helpful, and positive people you can imagine. I highly recommend her book. Simple Green Meals has been helping us get more vegetables in our diet, and these recipes are so unique and flavorful, plus gorgeous photos make us want to eat every one! 100 Days of Real Food on a Budget is a new favorite, especially because Lisa’s girls have recipes in the book! 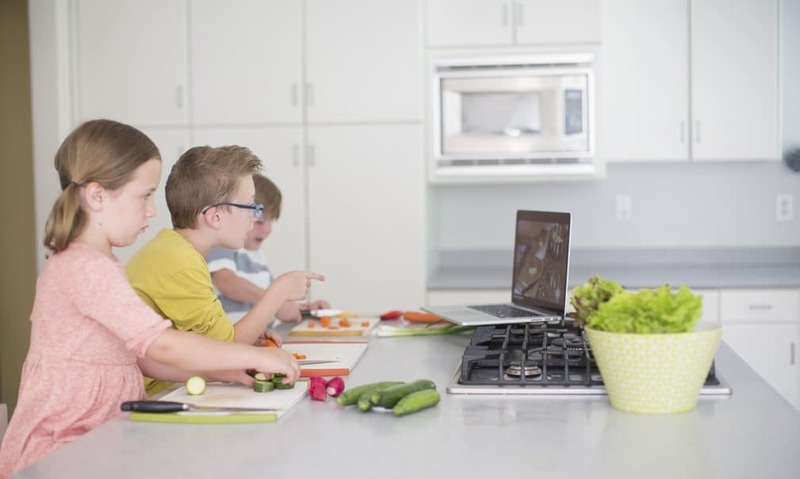 She’s a big proponent of kids cooking and yours will be inspired by these photos and simple recipes (and you’ll be happy to save a few bucks per meal! ).